Last night I left my phone in a taxi. I know. I'm ridiculous. Yeahhh. That's how it was. 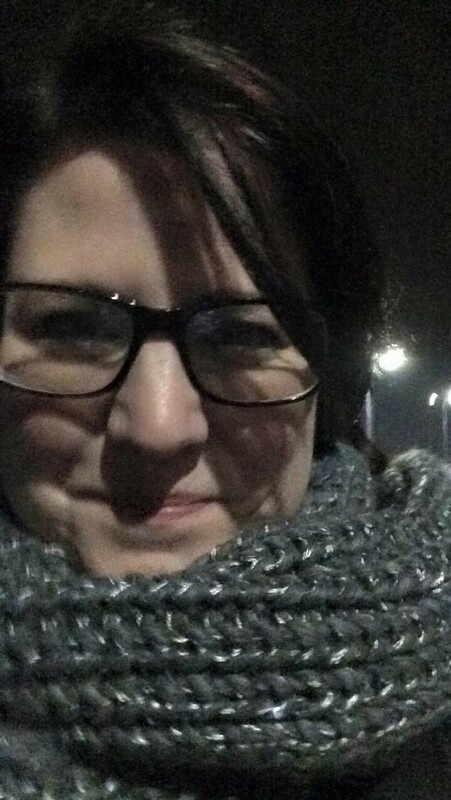 I'd had a lovely evening with friends, visited three bars and a restaurant, then got a taxi home. As soon as I walked into the house I realised I didn't have it. For a nervous half hour, I worried, sweated, and mentally retraced my steps. Using another phone, I contacted the restaurant and left my email, rang my friend in the taxi to check if it was there, and tried to get in touch with the last bar I'd been in. It was at that point my friend in the taxi rang back. It had been on the floor, unlit and elusive until he'd got out. It was found. Panic over. speeding off into the night. In New York. As horror stories go, it's not really up there, is it? The Mystery of Nicky's Lost Phone is hardly going to sell out cinemas. Nor would the paperback hit the best seller lists. It's just one of those things that happens. And in a few hours, there'll be a happy conclusion to the narrative when I meet my friend and am reunited with my phone once more. But the past twelve hours - for indeed that's how long my phone and I have been apart - has been challenging. Once the fear of having lost the thing went away, the practical realities kicked in. I didn't have an alarm clock. I was unable to add the food I'd eaten to my WW app. I couldn't fall asleep to Netflix. Straight away - well at least within an hour of being phoneless - my routine was all over the place. Don't say you don't miss it. I want to be better than this. I don't want my world to feel empty and frightening because I've lost a piece of technology. A piece of technology I grew up without, managing perfectly well until my mid-twenties when I got my first Nokia. And yet, as I've outlined before, phones are more than phones. Lives are organised through apps. Work priorities, friendships contact groups, banking - it's all there. Until the time it's not. It's in a taxi and you can't set an alarm. So, how will I cope for the rest of the day? Well, it's not as facetious a question as it sounds. I'm genuinely not being sarky. I have to rethink a few things. My work To Do list was on the phone. I can't remember all the things I'd planned to box off so I feel a bit untethered. My shopping list for Tesco was also on there. I'll have to spend sometime recalling that - and because I think I'm Nigella, it was full of random and specific ingredients rather than just 'pies'. It'll take some time. Then there's the family WhatsApp group. They won't have even clocked my absence. Instead, when I get my phone back, I'll have 9675 messages, focusing on banter. Plus funny vids of the Niece and Neph. Catching up with all that will fill an evening, no mess. The good news, however, is that the top priorities for today have already sorted themselves out. My main To Do list - the one that starts with 'Get up' and 'Drink tea' - had two main tasks to complete. These were 'Think of blog topic' and 'Write blog'. I can now tick those off my list. My paper list. All I need to do is find a pen. I'm in a writing group. This has been the case for the past six months. Once a fortnight, I rock up to a Portuguese cafe in town, have a Diet Coke (or wine if I've trained it) and listen to other people read their short stories, poems, or chapters from their current works in progress. And sometimes I read too. The reading aloud thing is nerve-wracking. I can't lie. It's like being at school. Except instead of indifferent, bored peers who are just waiting for the bell, these are interested, opinionated, fellow writers, whose sole reason for listening is to tell you what isn't working. Yet despite those high stakes, it is enjoyable. It is certainly useful. I'd been looking for something like this for a while, so when I found it, everything felt a little easier. I had people with whom I could talk about writing. People who understood. The only slight problem is that I joined after I'd completed the vast bulk of Leeza McAuliffe Has Something To Say. I was down to the tinkering and spellchecking stage. So when I read a chapter or an extract, the feedback from peers was happily welcomed, but ultimately ignored. It had to be. I'd already commissioned the front cover, which included the dimensions and spine width. If I added any more pages, or reduced them, the whole thing would have be off. Any tinkering had to maintain the 388 pages that the spine covered. So when someone picked up on a typo, that was fixable. But when someone told me it might be better to include extra detail about what the rest of the class were doing while Leeza was describing the Medieval Banquet that Ms Archer had set up - well, it might have been good advice, but way too late. 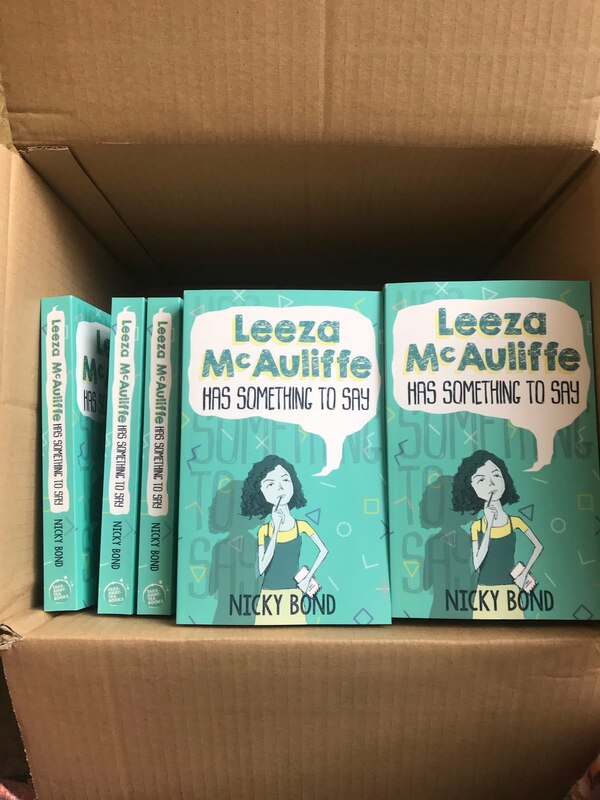 Since Leeza McAuliffe has been in her final stages, I've not read anything out. There's been nothing new to share, and it seemed daft to cover old, completed work. It's meant I've been fairly quiet over the meetings. I've missed being as much a part of it. Meanwhile I've been writing up a frenzy in Book Three's planning file, (outlined last week) but am still a while off from paragraphs and pages. But that's when I had a good idea. I could share my planning process. 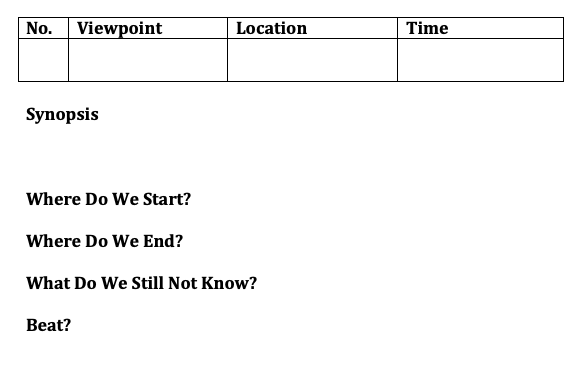 Last meeting, when it came time to share, I outlined how I'd been working out the details of the next book. And in the spirit of (over) sharing, I'm going to do the same thing here. Mainly because, despite being with some other novel writers, people seemed interested in what I'd done. There's no one way to plan a novel, and everyone does it differently. That was clear at the meeting. We've all approached our work in our own way. Here's how I've done mine. 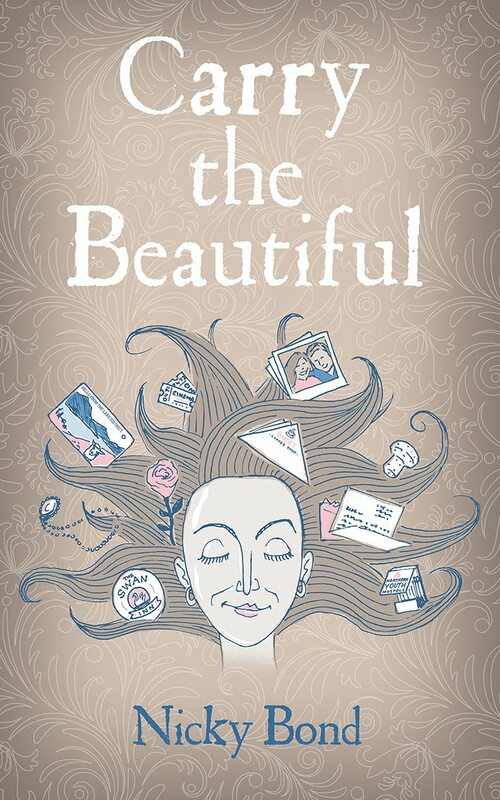 This is a follow-up story to Carry the Beautiful. 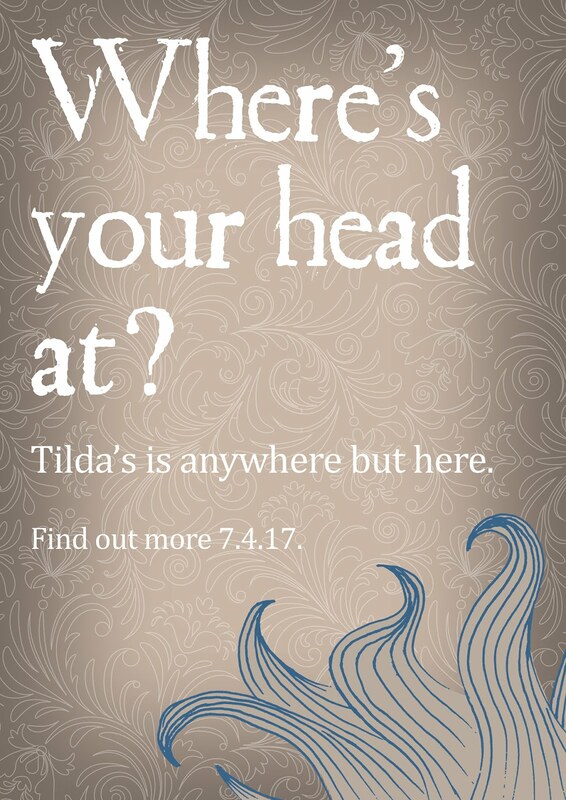 It follows the lives of three of the characters - Tilda, Bea, and Stewart - and takes place a couple of years after the end of the novel. All three are in different places in their lives (geographically and emotionally!) and individually going through 'something' at the beginning of the book. Every chapter of the next story has a completed planning sheet. So far - before I've started to write the thing - there are thirty-five chapters. As I get writing, that'll probably increase as I split some of the unwieldier ones. Apart from all that, I've also got a page of themes I want to weave in. They mostly focus on ageing, legacy, and the meaning of life. You know, standard blah blah blah stuff. And I've got a page of title ideas. So far, there are about thirty possibles jotted down. I've not found The One yet. It isn't there, but I don't need to worry about it for another year or so. Bags of time. Ah. It's nice to brush off an old ad. 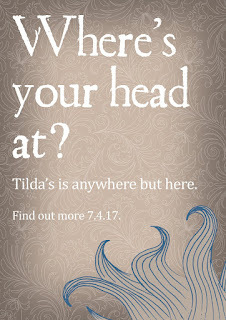 So while I continue to use the working title of Tilda Returns (it's so not going to be that, don't worry) I'll keep scribbling notes in my file, keep cross referencing chapters with nods to the themes, and keep making sure that when mid-June comes, I can sit down with my plan for chapter one, and type and waffle until it's done. Look, I never claimed to be Virginia Woolf*. I'm not writing highbrow literature to be studied by scholars. I'm content with creating likeably flawed characters that take people away from their own lives for a bit. I want to make readers smile, laugh, and be moved. That's about it. But the fact that I cannot wait to dive in and get started has to be a good sign. Hasn't it? *This is true. I have never claimed this for a second. I included a Virginia Woolf reference here because she was a female writer I studied back in the day, and I felt she represented the 'highbrow art' end of the spectrum rather than the 'enjoyable beach-read' genre I seem to fit. Despite that, I love the idea of writing as a stream of consciousness. Indeed, this blog often does that without even trying. Amongst the fairly dull stuff I had to read and discuss at Uni, To the Lighthouse was one of the less dull ones. Plus I really liked the film, The Hours. So there. I just didn't want you to think I was slagging off Virginia Woolf. Not on my watch. I do love a good plan. A future project, broken down into bullet points, priorities and a timeline. Thrilling. I have plans for everything - archived past events, or ongoing current stuff. At the moment my desktop contains documents relating to the clothes needed for an upcoming mini-break, money everyone owes me for booking my brother's wedding accommodation, and a multi-foldered file containing the planning and research for Book Number Three. I do love a good plan. Indeed, the file for the next book is filling up nicely. Snippets of dialogue that I've noted as it popped into my head, photos of locations where the action happens, a basic plot - it's all in there. I've even got a date set in mind to start writing. Mid-June. That takes me to a part of the year when all the busy-ness has finished. Birthdays, weddings, and holidays are over. I can type through the summer heat whilst taking full advantage of the air con in Costa. I have a plan, it's going to start in June, and my life feels ordered and calm as a result. Except of course it's not. Best laid plans, and all that jazz. Obviously there was going to be a spanner in the works. Nothing runs smoothly, even when there's a colour-coded timetable to guide proceedings. The reason that things are up in the air at the moment is simple. I watched Fleabag last week and now all I want is to be Phoebe Waller-Bridge and write utter perfection. OK. Let's back track for those not up to speed with my head. Series Two of BBC1's Fleabag airs on Mondays. 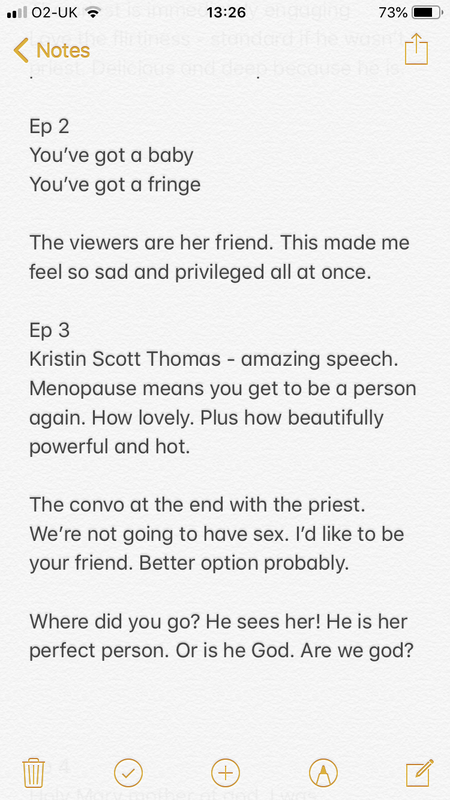 Tonight's is episode five. Phoebe Waller-Bridge writes and stars in it, and it's perhaps the most perfect half hour of television I currently watch in the week. The characters, the dialogue, the situations, the humour, the poignancy, the layers, the questions I have after every episode - all lead me to conclude that PWB is an absolute genius. Last week's episode made me hyperventilate. Then it made me go right back to the start and watch again. Then, a few hours later, I watched it a third time. 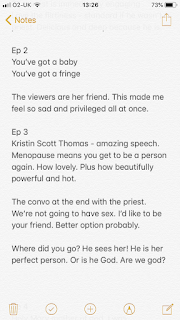 Then I followed the Fleabag hashtag (#fleabag #justsaying) and saw everyone else's thoughts, which were - unusually for a Twitter hashtag - a hundred percent positive. More than positive, they were completely reverential. Then I had a sleepless night thinking about all the things I think about this series. And then I watched it again. I won't lie, it's been quite the week. But I digress. I'm not here to write paragraph after paragraph about how good Fleabag is. I don't need to. You've either seen it or you haven't. You know or you don't. What I'm digressing from is how my best laid plans of a writing schedule have gone awry. Put simply, by immersing myself in quality writing from PWB, I've been given a creative boot up the backside. My juices have been flowing (now then) all week. What was boxed off to start in June, when all of life had calmed down, is now rearing its head nearly three months early. I am gagging to start writing again. I cannot wait. I want to do it now. The past few days have seen me scribble away in my planning book. Asterisks, arrows, and PTOs are littered all over the place. I've developed my three main characters with loads more depth and backstory. Loads more nods to the past and echoes of previous behaviours. Loads more good writing. I'm desperate to dive in. This wasn't so full last week. 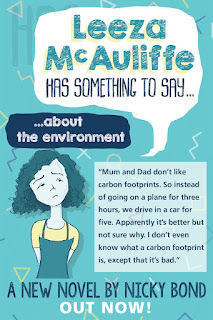 I realise it's hugely arrogant to say I've been busy doing 'loads more good writing'. (And that sentence alone, suggests I'm lying or delusional.) When the book is finally finished, it may turn out to be a big fat pile of rubbish anyway. The point is, that in watching the execution of absolute quality, I've been inspired to do better myself. No plot detail or character trait is the same - I'm not knicking anything from someone else's TV programme. I've just been pushed towards cracking on with the ideas I had, but making them work better. June might be when I set aside the time to prioritise this project, but I'd be stupid to ignore the rush of adrenaline I've got right this second. If inspiration is striking now, I have to go with it. I have to ignore my schedule! So what's my point this week? I concede it's a ramblier ramble than normal. (Blame Fr. Kneel!) I suppose my point is that when plans go off track, it isn't always a bad thing. The past few days have been a creative hotspot. And if I'd waited until June to start, what are the odds that I'd have been dragging myself out of bed to look at a blank screen for hours, more times than not? No thanks, I'm not a gambler. I'm not taking that risk. All I can do now, is squeeze in as much writing whilst the juices are flowing. Crack on whilst the buzz is at its buzziest. And as for the quality inspiration that's kick-started it all? I'll be keeping Fleabag firmly on the planner. For ever and ever... Amen. 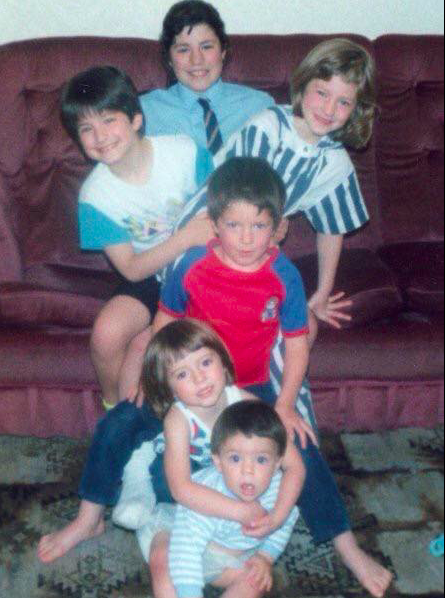 Birth order research is always an interesting topic, innit? For my own birth position - eldest in the family* - there have been a long-held set of traits that are supposed to be symptomatic of that role. I'm apparently more likely to be conformist, high-achieving, and conscientious. Younger siblings are supposed to be more chilled out and liberal minded. It's all a bit simplistic to be factually accurate, even if I am some of the things it says I could be. Like horoscopes or the Pygmalion effect, being told you are something, might make you be that something without realising. Besides, there's recent research into birth order that has exploded the myth that it makes a scrap of difference to anything, anyway. What will my socially-engineered conformist, high-achieving self do now? Probably just crack on and not think about it too much. My untested hypothesis is that because I had to be selfless growing up, I am now happily selfish as an adult. Before there are whip rounds and crowdfunded plaques to mark my good natured youthful generosity, it wasn't by choice. I was not a kind, giving sort because it was within my nature. It was just what circumstance dictated. (Like everything tends to be when you're a kid.) For me, between my baby brother slicing through the hair on my cello bow because he got hold of some scissors for ten seconds, to revising for my A Levels in an empty room of the local Catholic Retreat Centre because the bursar could see it was tricky to study at home,** I worked around the bustle and chaos because there was no choice. The upshot is, I'm a happily selfish adult. I like being in control of my environment and keeping it bustle and chaos free. I've made choices that enable that to be the case for as long as I can see down the line, and I'm very happy with all of that. Putting up with chaos. As per. So why bring all this up now? What has triggered a reflection on upbringing and personality this week? Well, the most selfish day of the year - no, let's ditch the S word with its negative connotations and go for me-centred - the most me-centred day of the year is my birthday. I very much enjoy being the focus of attention for the day. Despite my younger siblings arguing to the contrary, it feels like it's the one time I get to be bossy. (I'm bossy lots of times but my birthday feels like the only day I can call the shots and expect to be listened to.) And readers, last week was my birthday. Neither of us are on the toilet. Hurrah, woohoo, tra-la-la I hear you sing! Sing on! But for the last three years, there's been a shadow over festivities. I've celebrated my recent birthdays in a haze. The one day I could demandingly claim as my own for my first thirty-seven years, stopped being such when I turned thirty-eight. The reason is simple. My nephew. DUH DUH DUHHHHH. Despite a due date of early March, the little blonde cutie chillaxed in utero, two weeks longer than scheduled, waiting till my birthday eve to kick off labour. He couldn't have timed his plan better. Slap bang, mid-morning, just as I just returned from a birthday brunch, I got the 'he is born' text. The absolute cheek of the birthday-stealing scamp. Obviously, I'm joking. Sort of. My nephew is a cool little guy. 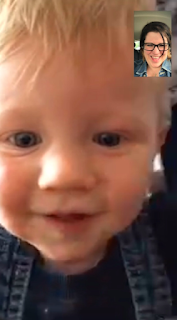 I enjoy FaceTiming him, often catching him in the middle of eating carrot sticks, or sitting on the toilet. (He always takes my call.) But the birthday thing has been a stumbling block. Because no matter how understanding my sister is (and she is), during a birthday get-together with the family, no one prioritises me. Of course they don't. I'm old news. There's a little kid who's only had two previous birthdays. Obviously they're going to make a fuss of him, and laugh at my annoyance at being usurped. All of which makes me more annoyed, and everyone else more amused. This year I decided to tackle the situation head on and be the bigger person. (Soooo hard.) 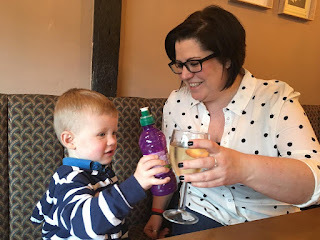 I offered to take my nephew and my sister out for lunch a couple of days before. We ate chips, shared a birthday cake, and sang happy birthday to each other. It was good fun. I won't lie, the tiaras felt right at the time. On my/our actual birthday, it was less exciting. Sunday birthdays feel like a waste. I'm not working anyway, so there's no delicious thrill of a weekday skive. Plus, no one wants to party on a Sunday night. 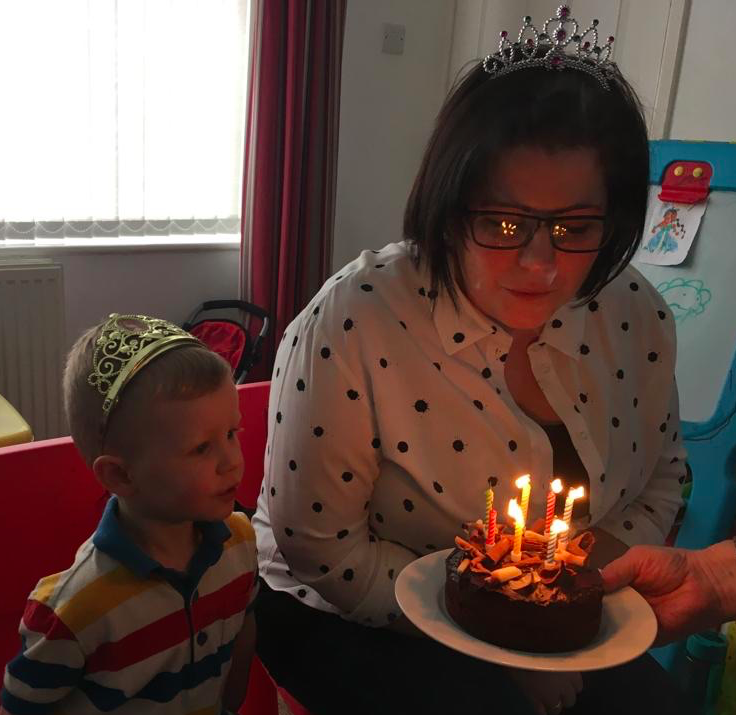 And the Saturday and previous Tuesday were more family birthdays. It's a conspiracy! In the end, come Sunday, I decided to ditch the Weight watchers plan and have a chippy tea. I do this never so it was fab. And on top of that, I drank a bottle of champagne. I like to think it looked effortlessly bohemian rather than demented and stomach gurgling. Who knows, who cares? Not me. Perhaps I've grown up? Maybe forty-one is the year adulthood starts? The year I can happily accept I share my special day with a recent interloper, and not bitterly resent everyone's jokey comments about it. This could be it? Maybe. Hmmm, not sure yet. Let's calm down and not be too hasty. I'll see how the rest of the year goes before I work out if I'm ready for full acceptance of the situation. Obvs, I will keep you posted as and when that happens. **That's got to be a niche experience even among fellow large-family members. I owe my A, C, and D to the Jesuits. One last thing. 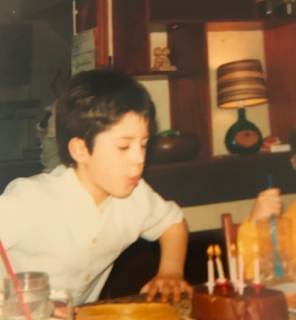 After the final read through before posting this, I've spotted that both pictures that show me blowing out candles, appear to have involved the exact same cake. Thirty-two years apart. I appreciate my online presence has been a bit one-note recently. I'm almost boring myself, these days. Look, the thing is, I wrote another book. I still love that fact, but I'm well aware that regular followers of my Twitter feed, Facebook page, and this blog, will be more than au fait with my publishing news. I've talked about nothing else for months. So it's with some trepidation that I press on with a similar theme today. There's a slight twist though. I'm doing one of those blogs where I give insight and advice to anyone wanting to follow my lead. I will not let the door close behind me. Not on my watch. I've done the research so you don't have to. In the space between Book One and Book Two, I've learnt a bunch of things I didn't know before. My usual disclaimer remains in tact - this is a UK-centric perspective, and my insights are based on random blogs, websites, and tweets I've ingested. I check things out when I need to, and go with the flow at other times. It's always best to get a second opinion, but I can start you off in a general thought direction. You cool with that? Marvellous. On we trot. 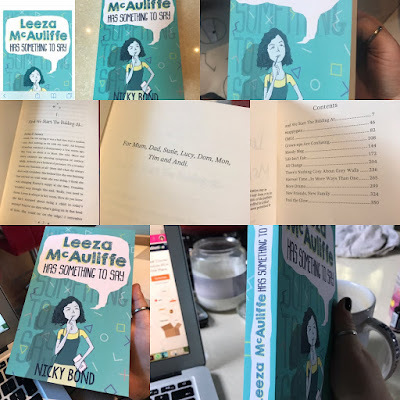 So whilst I urge you to order your copies of Leeza McAuliffe Has Something To Say with immediate effect, I give you in return, my list of Things I Have Learnt About the Writing and Indie-Publishing Process Whilst Going Through It a Second Time. Catchy, isn't it. This means that any pre-orders in the six months prior to publication hang around on the Internet chilling out, until the book is released. Then they get included in the first week's sales. That's the optimum time for making an impact. For big hitters, that's when a book hits the charts. For little old me, it might be when Amazon's algorithms notice that something exciting is happening and make my book more amenable to a search engine or be linked in the 'Customers also bought...' section below other books. Either way, release week is key. I'd never heard the term 'One-Sheet' before. Either that's because it was made up by a random blogger, or I've lived a sheltered life. Either way, it was one of the more useful things I did. The one-sheet was an A4 side of paper that contained all the book's info. The title, author name, front cover, author photo, author bio, blurb, ISBN, formats, cost, where it's available, and author/publisher contact details. 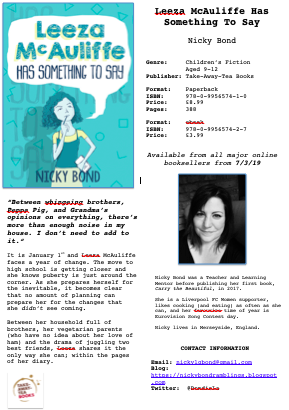 It was useful to send out to schools and libraries, and it was handy when anyone wanted to pass on the info to someone else. I could just reach into my bag (yes, of course I carried them around with me) and pass them a sheet. Somewhere along the way, I read that most books are released on a Thursday. This wasn't the most convenient day for me, but I stuck with convention. It meant I had a fuzzy head on the Friday morning when work was happening, but who am I to argue with established wisdom? Now, here's a thing I didn't know. Every time someone takes a book out of the library, the author gets some money. It's only a few pence, but if it's a popular book that is constantly on loan in multiple libraries, then it all adds up. To receive payment, the book needs to be in a library - I'm working on that one - and then registered with the Public Lending Right people. I didn't know or do this with Book One, but I'm on it with Book Two. Don't you worry about that. Last time, I was chuffed to bits that reader reviews started coming in, a few days after it was on sale. These were mostly on Amazon, although not exclusively. It was the loveliest of ego boosts to read that people had enjoyed my outpourings. This time I know a bit more. Like pre-orders, reviews help boost the amount of notice that Amazon gives to the book's URL (I think I know what I'm taking about but not really). Reviews are important but, here's the thing. Amazon get shirty if you ask people to review your book. So I am definitely not doing that here. No way, not for a second. I'm only talking generally. Also, they took down two of my reviews last time because they clocked they were from relatives. Even though those relatives had genuinely enjoyed my book. (I'm not sure about anyone else but my relatives wouldn't do me the courtesy of a fake review. They're hard as nails and every drop of approval is earned.) So it's a tricky line to balance. Reviews are essential. Everyone should review books they've enjoyed because it means so much to the author (in terms of nice feelings as well as upping sales potential) but authors are impeded by being unable to specifically ask for them. This is all the trickier when you're a small little outfit like my good self. So between the need for pre-orders and reviews, the sweet library dollar, and the one-sheet creations, the second publishing experience has been another steep learning curve. As with everything in life, I'm winging it most of the time. But if my words of wisdom can help anyone with anything, then hurrah to that. Here's to Book Three! I'm not going to lie. That was an exhaustingly amazing week. When I planned the publication date of Leeza McAuliffe Has Something To Say, there were a couple of factors to consider. The pre-Christmas window had just ended. I decided to give January a swerve - no one likes spending money in January - and focused on a Spring release date. I also avoided family birthdays or booked holidays. I read somewhere that books come out on a Thursday, so the 7th March 2019 seemed as good a fit as any. My pre-teen, coming-of-age story, was ready to greet the world. collages. Marvel at my skillz. It was quite the surprise when someone* pointed out that 7th March 2019 was World Book Day. I mean, what are the odds! I did NOT know this when I chose it. Honestly. I'd love to take the credit for such a perfectly chosen publication date, but it was just a coincidence. I promise. Fast forward to last week, and three exciting things happened. 1. 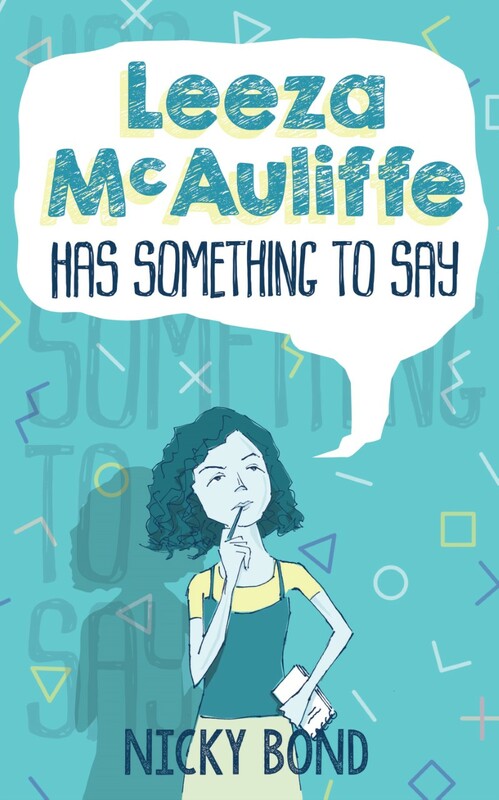 Leeza McAuliffe Has Something To Say was published. 2. 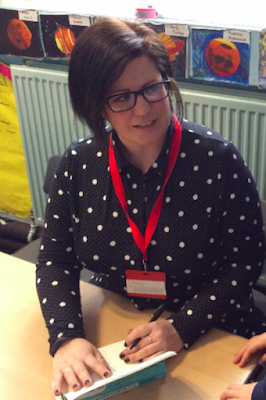 I visited Thatto Heath Community Primary School during their book week celebrations, to talk about my novel. 3. I attended my brother's stag weekend. The school visit came first. 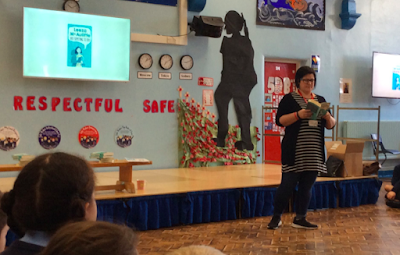 I'd had a few younger readers give me feedback along the way, but to have an entire Upper Juniors listening to me read the opening pages, was nerve wracking. I have forgotten ALL my teaching skills. Literally every single one. It was quite the thing to stand in front of a hall full of children and hope that they listened to me. But they did! I read the opening pages of Leeza McAuliffe, and no one fell asleep! No one told me to shush! No one looked like I was forcing them to endure a terrible experience! My day was made. In fact, the questions that came out of the Q and A sessions were brilliant. I was truly grilled. When did you start writing? What authors have inspired you? Do you use a laptop or pen and paper? ** These were great questions that I could answer reasonably well. Then there were questions that took a few seconds to consider. Have you ever thought about writing a prequel to the story? What's your financial situation? Which of the characters would you want as your best friend? *** I hope I answered everything as honestly and clearly as it was asked of me. It was such a lovely morning. Publication Day was the same as any other working Thursday. More or less. I spent the majority of it online, deleting the 'pre' from 'pre-order' on any site I'd advertised. 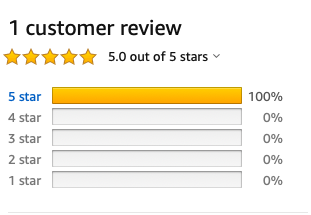 I also tweeted a lot, responded to messages, and encouraged anyone who felt inclined, to leave a review on Amazon (or wherever they bought their copy from.) The only difference from a normal working day, was that I toasted myself with Prosecco as I worked. (Who do I think I am? Alexis Carrington?) It was a throughly enjoyable day, where amidst all the admin, I felt proud, and accomplished, and special. For so many months, writing happens quietly. The regular 'How was your day?' question gets answered with a grunt and the response of 'Just been writing', more times than not. I don't really share the details. It can be fairly dull to hear that five hours of the day were spent rewriting two paragraphs that 'aren't quite there yet'. But on days like Publication Thursday, or being invited into schools, it all feels thoroughly thrilling. The previous months (or years) make sense. It was all building up to this point - the point where it's clear (to myself as much as anyone) that I was spending my time fruitfully. Like I said, I felt proud, and accomplished, and special. I'll mention Leeza a bit more over the next few weeks, before it's time to move on. If you've ordered it, thank you so much. I hope it's a enjoyable read for you or your kids. And if it is, please feel free to tell everyone you know. Also, a big thank you for the retweets, shares, likes, and future reviews that you may feel inclined to write. (Please do. Even it's just a line.) I'm so grateful for your help in spreading the word, and nudging those algorithms. Every little helps! *My brother Dom. He always likes a name check. **When I was in primary school/ Judy Blume/ a pen for planning and a laptop for writing. ***I hadn't thought of writing a prequel UNTIL NOW/ my finances aren't as good as when I was a full-time teacher/ Jenna, or all of them, or Jenna. A new woman started at my Weight Watchers last week. She wasn't totally new. She'd been a member a few years ago, before she'd had a baby. As I was getting a coffee, she asked me if the app was the same as it'd been back then. Did she need to manually type in her weight every week. I confidently replied that she didn't. Since we got scannable cards, our data syncs to our apps without having to do anything. She thanked me and that was that. But, oh the shame of it all! That night, when I was playing about with a new feature on the app (if you collect enough 'wins' you can swap them for a water bottle or similar - cha-ching!) I noticed that a recent re-jig included the requirement to manually type in your weekly weight again. I felt sick. I'd given the woman duff information. I hadn't lied knowingly, but she'd walked away thinking one thing, when the truth was the complete opposite. Fast forward to the following WW meeting, and I confessed immediately. Fair play to her, she took my opening words of, 'I've been thinking about you all week,' in her stride, and then laughed when she realised I'd felt bad for misleading her. She'd worked it out herself. She was fine. Pheewwweeee. I wonder if those that extolled the virtues of Brexit feel the same way. 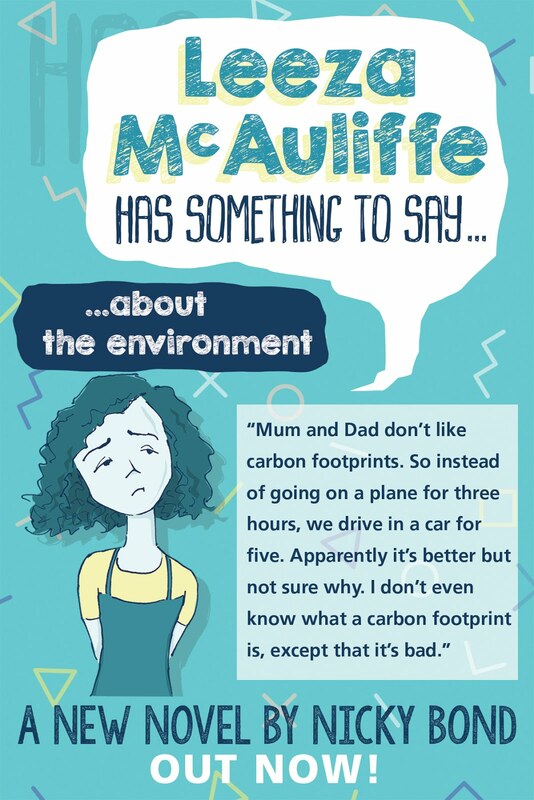 Those politicians that confidently claimed how easy it would be to negotiate a deal - have they ever paused to feel guilt about the misconceptions they spouted? If we take it on face value that they didn't deliberately lie - a big stretch but let's go with it - are they frantically making amends at their first opportunity. Are they door-knocking every constituent they misled, and explaining that they hadn't released the reality of the situation? Of course they're not. Otherwise we wouldn't be where we are. I've resisted the urge to write about Brexit since the whole sorry mess happened. And I'm going to continue to resit, so don't worry about that. Far more intelligent people than me have got this covered. Marina Hyde, James O'Brien, Ian Dunt - they're all there to google. And there's a whole load of opposing views alongside them. So far, I've contained my opinions to personal conversations and the odd retweet, and that's fine. Besides, with each passing day, a new twist or development takes place. I'm writing this a week or so before I plan to post it. Who knows what the situation will be then. Probably not the people in charge of achieving it. But let's leave the specifics aside, other than to say it's interesting (definitely a euphemism) how the consequences of Brexit affect different groups of people. Small businesses, UK-based EU citizens, car manufacturers, the NHS, (medicine shortages and price rises have already kicked in) and haulage companies. These groups understand how leaving the EU will affect them. A troubling thought occurred to me the other day. I've been mulling it over but I can't see an alternative. Let me explain. Can you imagine reading a novel set in 1940s London that doesn't mention the war? You can't, can you? It'd be all blackout curtains, bombed buildings, and air raid sirens, even if that were just background for a family saga or political thriller. Likewise, can you picture yourself settling down to some realistic fiction based in Dresden during February 1945, without it featuring the devastating fire storm? It just wouldn't happen. The events of the time were too far-reaching and all-encompassing. Here's a more recent example. How about a New York romance in the Fall of 2001 that never even hints at the aftermath of 9/11? Just no. Not likely at all. It can't be done. Unless your genre is science fiction or fantasy, it's impossible. Some events that take place, change everything that comes after. They can't be left out or forgotten when that era is literarily evoked. So it begs the question, how can I ever again, write a witty yet dramatic, ultimately upbeat contemporary, North of England-based novel, without mentioning Brexit? My next book that I'm currently planning is a sequel to my first. Carry the Beautiful was set in 2016. The next part of the story takes place a couple of years later - that makes it fall squarely in the midst of the two year negotiation window that began with the triggering of Article 50. Will my characters debate at length, or feel uncomfortable when the B word is mentioned? Will their personal finances and job security have changed since the previous instalment? Are they politically engaged or do they switch off the nightly news in order to keep calm? Whether I like it or not, I have to think about how I incorporate this into my fiction if I want it to ring true. The problem is, for someone who likes writing witty dramas that are ultimately upbeat, I really wish I didn't have to.